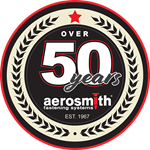 Aerosmith Fastening introduces new GT38Li Gas Track Pinner - a quality, high performance gas powered tool that allows tracking to concrete, block or steel. 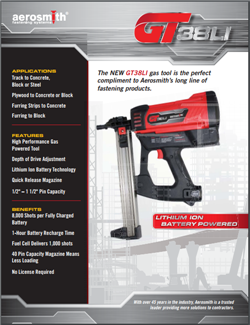 The GT38Li will also improve your efficiency with less loading time and 8,000 shots per fully charged battery. In conjunction with the new GT38Li, Aersomith also launhed the new TraxPin® line of fasteners. Or contact us today for more information.